Good food and old friends can connect a community like nothing else. We experienced this when we traveled to Mission, SD, on a recent Sunday morning to the Turtle Creek Crossing store on the Rosebud Reservation. This store serves as a central area for the Breakfast-in-a-Bag service through PWNA’s Northern Plains Reservation Aid (NPRA) program. The store has been in operation for over 20 years and serves over 500 Elders on the Rosebud Indian Reservation in south-central South Dakota. Through the service, each Elder aged 62 and older is provided a set list of items to pick up from an area grocer each month between February and October, with holiday items including a turkey available in November. 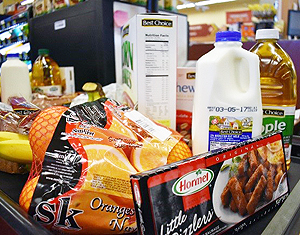 The items are available on the third week of each month and Elders can start picking up their groceries on Sunday of that week. We first met up with the store owner, Mike, to notify him that we would be doing some home deliveries to Elders in Rosebud, as well as to chat with some Elders who are shopping in the store. Mike had notified us that Monday was usually the day that most Elders shopped, but he was surprised to see a line at the door when he arrived in the morning. Apparently Sunday was the new Monday! After our conversation with Mike, we selected one of the small shopping lists available at the front desk, which provided the items and the aisle locations. The front clerk asked that we place the number associated with the Elder we were shopping for from the master list on the shopping list when we checked out. We shopped for #482 (Violet) and #490 (Rhoda) on this day. 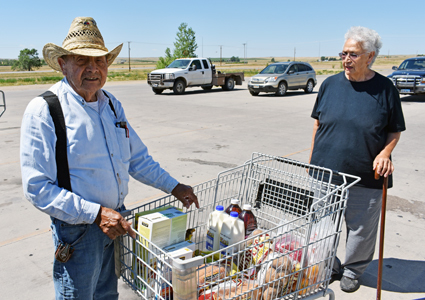 After we checked out, we saw two familiar faces: Homer and Rosalie, from Grass Mountain, a southern community of the reservation, and they were just finishing up their shopping for their month’s items. We followed them out to their car and chatted with our old friends. The last time we had visited with the couple was in 2012 during the Spring Creek fire near their home in Grass Mountain. Both were happy to see us and we quickly shared hugs. They also expressed their appreciation for the food service to their community. Rosalie revealed that there is nothing else like it available to Elders. She added, “We have a grandson who we have had since he was a baby and he is 7 years old now. He has been raised on Breakfast-in-a-Bag!” They appreciate the new items that have been added because of the high rates of diabetes in their reservation, commenting that, “We needed the additional fruit, and the apples and oranges are great!” Both are thankful that the service has continued to serve their friends and family. As we returned to the store, there were several other Elders picking up their lists and pushing their empty carts through the neatly organized aisles to fill up with the 10 items. We had to get on the road to complete deliveries to Violet and Rhoda in Rosebud, but it was good to see familiar faces enjoying themselves and visiting with one another. We may all have different backgrounds and journeys, but the connection of food and friends is real and appreciated!